Durable Design Meets Portable Convenience! call for help in case of emergency. compact design slips into your pocket or backpack for portability. hiking and outdoor activities! It even has an easy-to-use lighter that's perfect for emergencies. a handy kit for any survival situation. temperatures and crashing. DO NOT make charge while charging itself. Why Choose Our Solar Charger? Order Your Charger Now for Safe, Trusted Quality! ✅Stay Connected: Great for iPhone and Android users alike, our portable solar charger has 2 USB ports, allowing you to charge 2 devices at once! The built-in 12000mAh battery provides long-lasting power, while the compact design goes virtually anywhere. ✅Designed for Versatility: Thanks to our all-in-one design, this solar panel charger does it all! 2 3-mode LEDs (normal, SOS, strobe) offer illuminating light for camping trips or blackouts, and the convenient built-in lighter is a must-have in emergency situations. ✅Complete Survival Kit: Offering incredible value, our solar power charger comes with 4 bonus gifts! 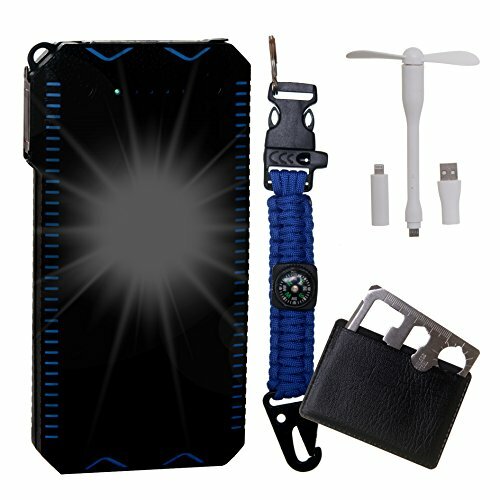 You'll receive a 2-in-1 whistle and compass keychain, flexible USB fan, USB charging cable and 11-in-1 service tool with screwdriver, bottle opener and more. ✅Trusted Quality: Featuring a protective case made with durable plastic and rubber, our solar USB charger is strong and shock-resistant! The best part? It's totally waterproof, allowing you to use it any weather condition including floods, hurricanes and blizzards. ✅Shop Risk Free: At FreeEnergyY, we're on a mission to provide innovative products and superior service! Our solar power charger comes with overcharge protection, so if you have any issues with your device, just reach out and we'll respond within 24 hours. If you have any questions about this product by FREE ENERGY Y, contact us by completing and submitting the form below. If you are looking for a specif part number, please include it with your message.